I the last two years I only owned a Gitzo GT3541LS tripod with an Arca Swiss Monoball P0 ball head. 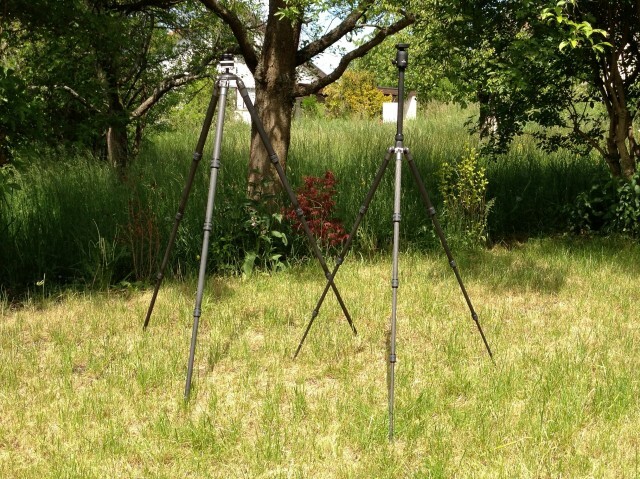 I really like this combination as the tripod from Gitzo's systematic series can handle up to 18 kg load capacity with a maximum height of 146 cm without a center column which tends to make a tripod unstable. The tripod is made of carbon and weights only 1.72 kg plus about 350 g from the ball head, but together with the ball head and a Kirk quick release clamp it has a closed length of about 65 cm. This is way too much to put it easily inside a back pack for travelling! Thus, on my recent trips I left my Gitzo tripod at home and only carried a GorillaPod Focus with me (You might want to have a look at my GorillaPOD SRL-Zoom vs. Focus comparison). This is better than nothing, but on my trip to Grand-Teton- and Yellowstone-National-Park I regretted not bringing a real tripod. My next trip will bring me to Costa Rica with all of its nature and so I wanted a real tripod which I could carry around easily! The search for the perfect choice was rather difficult. 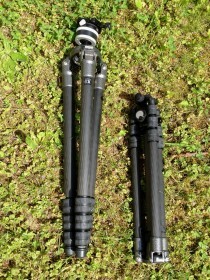 The first candicate was the Gitzo GT1550T Traveler Tripod with a built-in ball head. It only weights about 1 kg in total and has a closed length of 35.5 cm, but this comes not for free! It has five sections and the ball head only accepts a load up to 2 kg! As I'm planning to use a Canon EOS 5D Mark III DSLR with a Canon EF 70-200mm f/2.8L IS II USM lens and a Canon EF 2x III Extender which will a have a total weight of over 2.5 kg this was not a viable option. So I searched for alternatives and found the Gitzo GT1541T and its successor the GT1542T. They both have a weight of about 1 kg without a ball head, but the GT1542T has a slightly larger maximum height of 149 cm compared to the 140 cm of the GT1541T. This comes at the cost of a larger closed length of 42.5 cm compared to 41 cm and a longer center column. Especially the longer center column is a setback from my point of view as it is not possible anymore to put the ball head between the folded legs. So I wanted to go for the older GT1541T which is not available anymore, but I was lucky to get a used one in a very good condition. The Gitzo webpage recommends the ball head G1077M for this tripod, but I has the same limited load capacity as the GT1550T tripod. After some research I found the Markins Q3T, a modified version of Markins Q3 ball head. 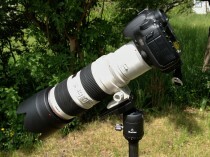 It is modified to fit exactly on the GT1541T tripod. As I found a very promising report on this combination on HOSSedia a I orded one and stated at the order that I don't want the quick release clamp to be glued, so that I could replace it with my Kirk quick release clamp I'm used to. This entry was posted in Photography and tagged Arca Swiss, Gitzo, Markins, Tripod by twam. Bookmark the permalink.